The reason for this has to do with outward processing trade, or OPT, European Union–initiated scheme that allows companies to cut parts for the shoes in one country, export them for assembly in another, then re-import the finished products back to the original country free of duty. The labels, slapped on the shoes at a later stage, can then claim to originate from the first country. 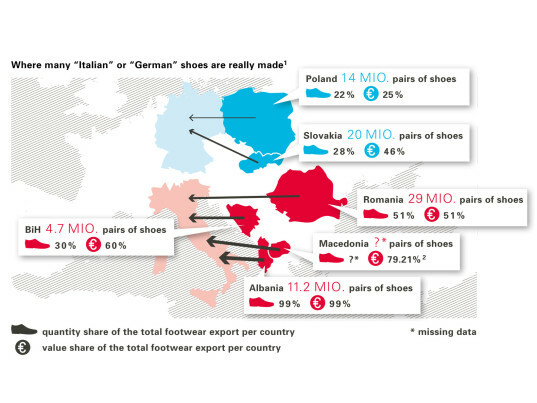 So while Italy is said to be responsible for 50 percent of EU shoe production, the reality is that many stages of the production process are outsourced to low-wage European countries. “By outsourcing labor-intensive operations to low-wage European countries while, at the same time, keeping those production stages with high added value in the country of origin (e.g. design and marketing), western European countries hope to protect their own textile and footwear industries and increase their profit margins,” Labour Behind the Label said. “While Italy is said to be responsible for 50 percent of EU shoe production, the reality is that many stages of the production process are outsourced to low-wage European countries. In its interviews with 179 shoe workers from 12 factories in the five aforementioned European countries, plus Poland, campaigners learned that the gap between an estimated living wage and the legal minimum wage in all six is sometimes considerably larger than the equivalent gap in China. None of the interviewed workers had been involved in a labor inspection. Neither had interviewees from Albania, Bosnia-Herzegovina, and Romania received training sessions on occupational health and safety. Others complained of the high-pressure environments. Suzanna, from Bosnia-Herzegovina, told a researcher that she works 45 hours a week and, on average, every other Saturday to reach the planned production limits. Although she doesn’t receive a bonus for exceeding her quota, pay is reduced if she doesn’t achieve it. Women are generally worse off, with statistics indicating that female workers earn less than their male colleagues, even when performing work of equal value. Poverty wages also lead to coping strategies that can double or triple their burden. During warmer months, fainting and heatstroke are persistent concerns. “In the summer, the heat is unbearable so we have had the ambulance here six times this year because co-workers had heatstroke,” a Slovak worker said. “In the summer, the heat is unbearable so we have had the ambulance here six times this year because co-workers had heatstroke,” a Slovak worker said. According to the workers and the websites of the factories they worked for, the brands and retailers that end up with their merchandise include high-street names like Zara, Deichmann, Bata, and Geox. The first step, however, is for manufacturers to be more transparent, not only about where their shoes are made but also about salaries and working conditions. Think that "made in Europe" corresponds with fair labor? You couldn't be more mistaken. 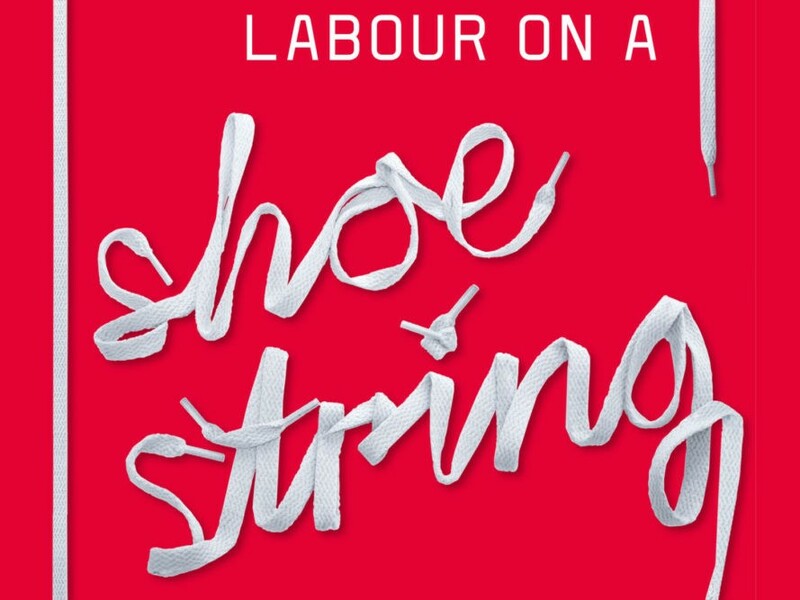 Slapdash working conditions and poverty wages are as endemic to the continent as they are to Asia, according to Labour Behind the Label, the Bristol-based workers-rights group behind new research on the "true cost" of Eastern Europe�s footwear industry. In fact, tens of thousands of workers who make shoes in countries such as Albania, Bosnia-Herzegovina, Romania, Slovakia, and the Former Yugoslav Republic of Macedonia often earn even less than their Chinese counterparts. Additionally, the manufacturing origins of the shoes don't always line up with what's purported on their labels, which means that terms like "made in Italy" or "made in Germany" can sometimes be misleading. "'Made in Italy' are synonymous with high quality and elegance�and fairly good working conditions," Labour Behind the Label wrote in Labour on a Shoestring, a report it published in June. "However, 'made in Italy' does not always mean that the shoes are actually manufactured on Italian soil."